Oh mystery chick with your curmudgeonly eye brows. How cute you are! Any guesses as to breed? Temporary housing - they have a heat lamp under the wooden piece. 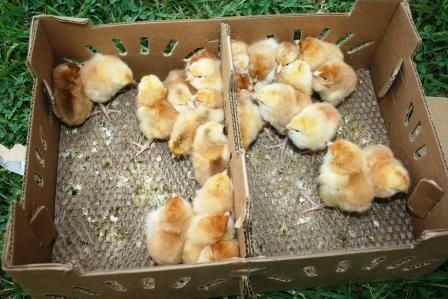 Once they are bigger and stronger, they'll move into a chicken tractor. Pierce holds a Cornish Roc X. Don't get too attached now, these guys are meat birds. The very next day, the Freedom Rangers arrived - 25 of them. Freedom Rangers are a more natural meat bird, a la old school chickens that people used to eat before all the meat bird crosses were created. This is our first attempt at raising them. We're actually going in threesies with the 75 chicks with some friends - so we'll each be keeping 25. There isn't much cuter than baby chicks in my book! My dad used to be a postmaster when I was little. He'd let me pet the chicks through the air wholes and talk to them. Good memories. Your little odd ball one is especially adorable! 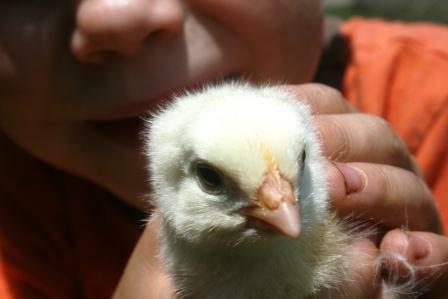 I agree: totally precious little chicks. I don't know that I could raise them and then eat them, though! Super cute, baby chicks are just so fun. We haven't had any in a while. I bet the boys love them. It may be hard for them to let them go. oh, i'm hoping you're keeping the mystery chick! i think it needs to be called "sparrow" as it certainly looks like one! Your mystery chick looks like an Aracauna/Ameracauna. Hope it's a hen! Amazing! I had no idea you could get chicks in the mail. So adorable! 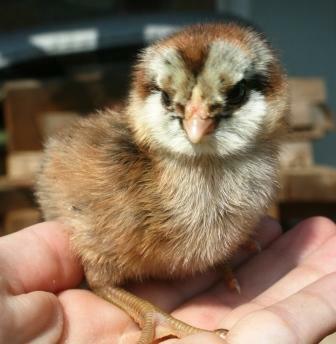 Chicks are so adorable! I love how they already know how to scratch around looking for food and I could listen to their peeping all day! Awww that looks like a fun package to get!! I agree Lisa-there really is nothing much cuter than baby chicks!! Oh my gosh, Oh my gosh, Oh My GOOOSH!! I LOVE THEM...all of them. Soo cute, the boys must be having so much fun with them! So you have chickens for eggs and chickens for eating? Do you sell any of the eggs or the meat chickens, that's an awful lot, unless you would freeze some! So cute, I love the little different chick! Amazing that they can survive in the mail, does it come overnight? Is it a special mail carrier, surely not the post office? Yes, chicks are adorable. I only did chickens for eggs. Cleaning fresh chickens is totally gross...not sure if you are aware of that, but you will be...lol. Wow, that's an ultra-cute batch of chicks, Lisa. Sometimes you get one chap with strange markings that just fade away after a while. So we've been caring for the neighbors 4 chicks. All we can have in city limits. No roosters. I have an odd questions maybe you can answer!! 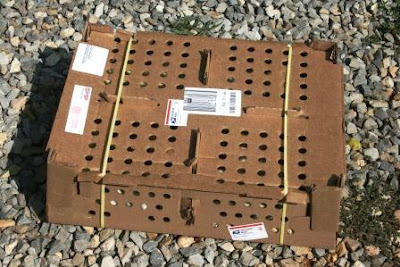 Can you still get eggs from the hens with no rooster? Someone told me no and the neighbors are hoping for eggs at some point. My husband is now talking about wanting his own 4 chickens. We'd want them for the egss though. Thanks! My friend has me enter the facebook contest each month for free chicks. I could deal with a dozen (maybe a half dozen)but when you order usually a min is 25 or more. So many more people are getting into the backyard chicken phase. I wouldn't mind, except for our super cold winters. May you enjoy and they prosper. 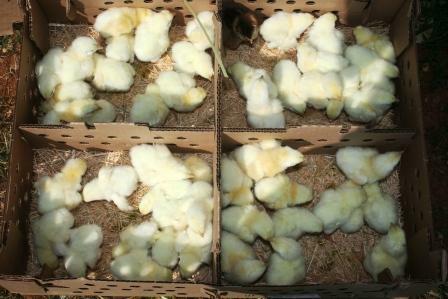 My mother would buy 200 chicks and I remember the fun we had scooping them out of the boxes and loved the smell of them and there soft downy feel. They were raised in a brooder house. We would get the whole family together and prepare them for the freezer in assembly line fashion. Those were the days! I am happy for all the life experiences you are having on your farm with your family. Oh, that was me Carol that just posted. I think I forgot to sign my name. I love baby chicks. When ours arrived in the mail, the post lady had them at the office and had already given them some water. So cute! That cracks me up that they went through the mail! By the way, we saw some chicks and some spectacular looking poultry at the Iowa State Fair today! Good for you guys raising your own meat birds! Oh I just love baby chicks! Do you have someone there that will butcher and clean for you? I have looked everywhere here and can't find anyone. You mean those cute little chicks just came in the regular mail!? How wonderful! They all look so fluffy and healthy. How neat, Lisa... Those 3 little boys will love those chicks... I love the 'oddball'... How cute!!!! How fun! Good luck chicken ranching. wow. my mom has chickens, but she cries when they die, so I think perhaps you guys are on different pages. I bet the boys will love these little ones! My FIL raised meat chicken one year and there is no comparison to the taste of homegrown chicken to the store boughten. I won't go into the gorey details of what a commercial farm is like. Hope the friends are going to help when the time comes for slaughtering and plucking! Awww, so cute! 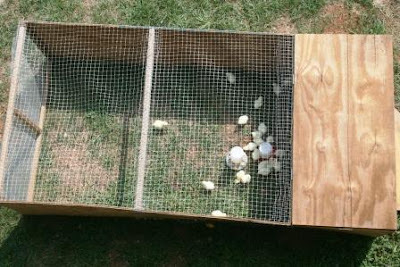 A friend of mine raised chickens for eggs - it always sounded pretty intimidating to me! I could never do it. Im too squeamish. That's great. So much healthier and a great education for your boys. Much better than junk mail! Frida Kahlo should be the name of that lil' chickie. GAH!!! Babies! You know how cruel this is, right? I mean, I can't get any baby chickies any time soon. Tom Jones. You should call him Tom Jones. Dark and swarthy - that's him all right. I don't care if it's a girl. Odd ball is odd ball. I actually began to pet the computer screen on the second to last pic. That's how pathetic I've become. How do you keep the critters away? Oh, I love those little chicks. We can't have chickens where we live or I would look into it. Baby chicks! I love each spring when they arrive at our Tractor Supply store. In fact, my little girl just ran over to see them on the computer screen. I think I'll skip talking about how they are meat chicks! lol. How cute! I hope they all do well, and I'm very curious to hear how the Freedom Rangers taste as opposed to the Cornish X. REALLY hoping your mystery chick isn't a mean little sucker like ours was! Okay, that is cute overload! Best mail ever! I have been reading more on your blog and you have lots of great information!